Department of Pharmaceutics, Tatyasaheb Kore College of Pharmacy 1, Warananagar, Panhala, Kolhapur - 416113, Maharashtra, India. NRI College of Pharmacy 2, Pothavarappadu, Agiripalli, Krishna - 522212, Andhra Pradesh, India. ABSTRACT: The main objective of the present research was to develop mixed micelles using two biocompatible copolymers, D-α-tocopheryl polyethylene-glycol 1000 succinate (TPGS) and poloxamer 188 (P188) to improve the aqueous solubility and targeting efficacy of Simvastatin (SMV) against a variety of hormone-dependent cancers. A solvent evaporation technique prepared the plain/single copolymer micelles (SCMs) and mixed micelles (MMs). 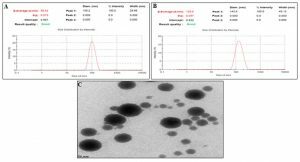 The prepared SCMs and MMs were characterized for critical micelle concentration (CMC), SMV content, particle size by dynamic light scattering (DLS), surface morphology by transmission electron microscopy (TEM), in-vitro SMV release and hemolysis. The SCMs and MMs showed mean particle size of 98 ± 5 nm and 129 ± 6 nm, respectively. SCMs showed SMV loading of 79.7 ± 5.6% while MMs exhibited improved SMV loading of 94.5 ± 6.5. The developed MMs system showed significantly lower CMC (3.5 fold less) than SCMs revealing their higher in-vivo stability. 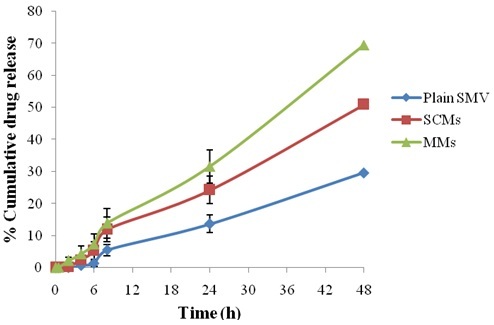 Moreover, SCMs and MMs exhibited zero order release profile, lower hemolytic behavior (<5% of hemolysis), when compared to plain SMV solution. The in-vitro cytotoxicity assay was conducted on MCF-7 (human breast cancer) cell line. Cytotoxicity studies revealed significantly improved antitumor activity of MMs when compared to SCMs and plain SMV after both incubation time points (24 and 48 h). In conclusion, the developed SMV-loaded MMs could improve the targeting and therapeutic efficacy of loaded SMV against hormone-dependent breast, prostate and ovarian carcinomas. Besides, this approach could be a potential alternative for development. However, further studies are needed to ascertain these facts. INTRODUCTION: Cancer is generally defined as an uncontrollable growth of cells due to mutations that occurs in the genes controlling the proliferation of cells. Hormone-dependent carcinomas are mainly of reproductive tract which includes prostate and testis cancer in men and breast, ovarian and endometrial cancer in women 1. Worldwide, breast cancer is one of the common and leading kinds of cancer in women, accounting for 25% of all cases. Prostate cancer, also known as carcinoma of the prostate, is the development of cancer in the prostate gland 2. Breast cancer develops from breast tissue; most prostate cancers are slow growing; however, some grow comparatively rapidly. The cancer cells may spread from the prostate to other parts of the body, particularly the bones and lymph nodes 3. To date, chemotherapy is the most dominant therapeutic tool against progressed, disseminated cancers. Statins, cholesterol-lowering agents, are commonly used in the treatment of hypercholesterolemia, dyslipidemia and coronary heart diseases. All statins possess a 3-hydroxy-3-methylglutaryl (HMG)-like moiety that has a high affinity to HMG-CoA reductase and sterically block this enzyme thereby inhibiting the production of mevalonate, the first step in the cholesterol biosynthesis 4. High levels of mevalonate production were observed in various types of malignancies such as breast cancer, 5 leukemia, lymphoma 6, 7 and prostate carcinoma cells 8. Statins were proven to block the mevalonate pathway by inhibiting HMG-CoA reductase; this would result in reduced levels of mevalonate and its downstream products isoprenoids intermediates. Therefore, nowadays there is a promising interest in the use of statins as anticancer agents owing to their pleiotropic effect on various cells and tissues. Amongst the statins, Simvastatin shows the anti-cancer activity on hormone-dependent carcinomas. However, the clinical application of SMV is limited due to its poor aqueous solubility and low oral bioavailability, lack of distribution to the skeleton, less biological half-life (only 2 h), and high plasma protein binding (95%). Therefore, efforts have been continuously made to improve the pharmacological and biopharmaceutical features of SMV in the treatment of cardiovascular diseases (CVD), bone-related diseases and cancers 9, 10. One of the most significant approaches to augment cancer treatments is the development of nano-particulate drug delivery systems. Pharmaceutical nanotechnology focuses mainly on designing therapeutically active and biocompatible nano-molecules in different forms such as nanoparticles, nanocapsules, and micellar systems. Among the existing nanocarrier systems, polymeric micelles are one of the most promising and well-investigated approaches that had improved the biopharmaceutical characteristics of hydrophobic drugs 11. The polymeric micellar system is considered to be a promising approach for enhancing the solubility, bioavailability and reducing the toxic side effects of hydrophobic drugs because it has significant benefits regarding drug loading, release, delivery, and stability. Also, the mixed micelles evident synergistic properties, such as increased micelle stability and drug-loading efficiency, compared to single copolymer micelles (SCMs). Besides, they also displayed improved pharmacological and biopharmaceutical characteristics as compared to SCMs 12. The copolymer TPGS more efficiently forms the micelles with the lipophilic drug and causes an increase in solubility, drug entrapment efficiency and bioavailability of lipophilic drugs. It can also act as a P-glycoprotein (P-gp) inhibitor and has been served as an excipient for overcoming multidrug resistance (MDR) and help for increasing the oral bioavailability of drugs. It was also documented that succinate esters of vitamin E behave as potent proapoptotic agents selective for cancer cells 13. Therefore, the main purpose of the present study was to develop the self-assembled SMV-loaded TPGS micelles (SCMs) and mixed micelles (MMs) in combination with the nonionic linear copolymer, poloxamer-188 (P188), as nanomedicines for targeting hormone-dependent carcinoma via enhanced permeability and retention (EPR) effect. Materials: Simvastatin was supplied as a gift sample by Tocris Biotechne Mumbai. BASF, India gifted poloxamer 188. D-α-tocopheryl polyethylene-glycol (PEG) 1000 succinate (TPGS, MW ~1513 g/mol) was purchased from Sigma Aldrich, Mumbai. All other reagents used were of analytical reagent grade and used without further purification. Cell Culture: Human MCF-7 breast carcinoma cells (NCCS, Pune, India) were cultured in Dulbecco’s modified eagle medium (DMEM) containing 10% fetal bovine serum (FBS). Cultures were maintained at 37 °C in 5% CO2 humidified atmosphere. Fourier Transform Infrared Spectroscopy (FTIR): The compatibility of SMV with different excipients used in the formulation was explored using FTIR. 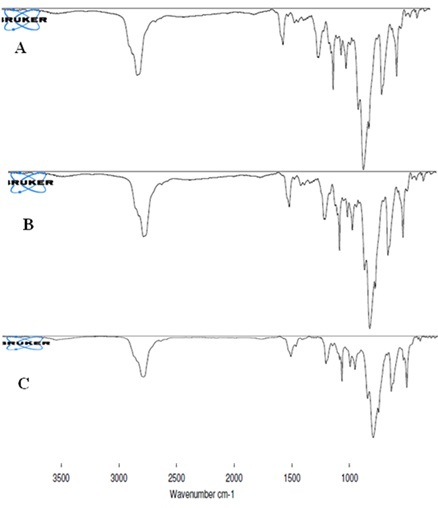 The FTIR spectra of plain and physical mixtures of SMV and copolymers (at 1:1 w/w ratio) were recorded on Agilent FTIR spectrophotometer (Agilent, Alpha 100508) in the range of 400-4000 cm-1. Differential Scanning Colorimetry (DSC) Analysis: Thermal properties of plain SMV and with different excipients used in the formulation were investigated using Differential scanning colorimetry (METTLER, STARe SW 9.20, Mettler Toledo GmbH, Switzerland). Accurately weighed samples were placed in hermetically closed aluminum pans, and the empty aluminum pan was used as a reference. The samples were heated at a heating rate of 10 °C per min up to 300 °C under inert nitrogen atmosphere 13, 14, 15. Determination of Critical Micelle Concentration: The CMCs of SCMs and MMs were determined using iodine UV spectrophotometric method. Briefly, a standard solution of KI/I2 was prepared by dissolving 1 g of iodine and 2 g of potassium iodide in double distilled (dd) water. Copolymer and mixed copolymer solutions of varying concentrations were prepared in dd water, and to each above solution, the same amount of KI/I2 solution (25 μL) was added. The final solutions were equilibrated for 12 h in the dark at room temp. Finally, the absorbance of all samples was recorded at 366 nm using UV-visible spectrophotometer 13. Preparation of Micelles and Mixed Micelles: SMV-loaded SCMs and SMV-loaded MMs were prepared by a solvent evaporation technique. Briefly, SMV and TPGS (at 1:1 and 1:2 mol ratios) were dissolved in 1 ml of ethanol. The prepared solution was then added dropwise into a beaker containing double distilled water (10 mL) under stirring at 500 rpm. The stirring was continued until complete evaporation of ethanol. The resultant solution was centrifuged at 5000 rpm to obtain a clear supernatant micellar solution. The SMV-loaded MMs (at 1:1:1 and 1:2:2 mol ratios) were also prepared similarly. Mean Particle Size and Zeta Potential: The mean particle size and zeta potential of prepared SCMs and MMs were determined using Malvern ZS Zetasizer (Ver. 6.20 Malvern Instruments Ltd). All measurements were performed in triplicate at 25ºC. TEM Analysis: Transmission electron microscope (TEM, FEI Tecnai T-20ST) was performed to evaluate the surface morphology of micelles. Briefly, the micellar solution placed on the copper grid was air dried first, and then negative staining was performed using phosphotungstic acid solution (2%, w/v). The phosphotungstic acid solution was air-dried overnight and then observed under TEM. 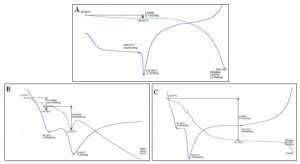 In-vitro Release Study: In-vitro release profile of SMV from micelles and MMs was determined using dialysis method and was compared with the plain drug solution. Briefly, the SMV, SMV-loaded SCMs and MMs equivalent to 2 mg of SMV were placed in a dialysis bag (MWCO=12000 Da) and tightly sealed. The end sealed dialysis bags were then incubated in 50 mL of release medium, PBS (pH 7.4), containing 1% (w/v) tween 80. The medium was maintained at 37 ± 2 ºC and stirred at 150 rpm using the magnetic stirrer during the study. At pre-determined time intervals (0.5, 1, 2, 4, 6, 8, 22, 30 and 48 h), 1 mL of sample was withdrawn from the release medium, and the same volume was replaced with fresh medium. The withdrawn sample was centrifuged at 2000 rpm for 5 min; the supernatant was bath sonicated for 5 min and then analyzed using UV-visible spectrophotometer at 237 nm. Experiments were performed in triplicate. Release profiles were expressed regarding % cumulative release and plotted vs. time 14. Haemolysis Study: To determine the safety and compatibility of micelles, a hemolytic test was performed 14. Briefly, the fibrinogen was removed from 10 mL of human blood by stirring the blood with a glass rod. 10 mL of 0.9% sodium chloride (NaCl) solution was added into de-fibrinogenated blood, and the supernatant was removed after centrifugation at 1000 rpm for 10 min. The erythrocyte pellet at the bottom of centrifuge tube was washed for four times (centrifugation followed by re-dispersion) with 0.9% NaCl solution. Finally, after repeated washing and centrifugation, an adequate volume of 0.9% NaCl solution was added to the erythrocyte pellet to give a 2% erythrocyte standard dispersion and was stored at 4 ºC for further use. 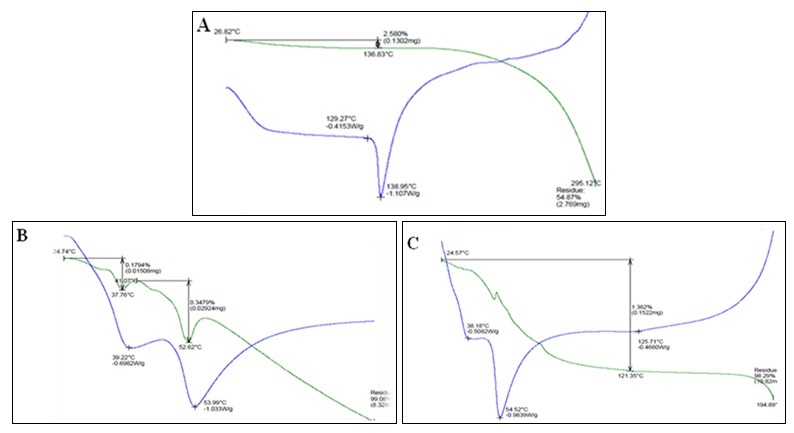 The SMV, SMV-loaded SCMs and MMs solutions of varying concentration were added into flasks containing 1 mL of 2% erythrocyte dispersion, and the final volume was adjusted up to 5 ml with 0.9% NaCl solution to obtain final concentrations (10 and 20 µg/mL). The negative control was prepared by mixing 4 ml of 0.9% NaCl solution and 1 mL of erythrocyte dispersion. The positive control was a mixture of 4 mL of de-ionized water and 1 mL of erythrocyte dispersion. After vortexing, the flasks were incubated at 37 ºC for 1 h and were centrifuged at 1000 rpm for 10 min, and the absorbance of the supernatant was measured at 420 nm using UV-visible spectrophotometer. The percentage hemolysis was calculated using the following formula 13. In-vitro Cytotoxicity: The cytotoxicity of SMV, SMV-loaded SCMs and MMs against human breast carcinoma cell line (MCF-7) were determined using MTT dye reduction assay 16, 17. The monolayer cell culture was trypsinized, and the cell count was adjusted to 1.0 × 105 cells/ml using DMEM medium containing 10% FBS. To each well of a 96 well microtitre plate, 100 μL of the diluted cell suspension (approximately 10,000 cells/well) was added. After 24 h of incubation, the supernatant was removed, the monolayer was washed once with medium, and then 100 μL of different concentrations of test samples prepared in maintenance medium was added and incubated at 37 °C for 24 h in 5% CO2 atmosphere. After 24 h, the sample solutions in the wells were washed twice with drug-free medium. The 100 μL of MTT solution (1 mg/mL) prepared in complete medium was then added to each well and incubated overnight. The plates were then centrifuged for 15 min at 1500 rpm (Rota 4R-V/fm; Plasters Crafts Industries Ltd., Mumbai, India) and the supernatant was discarded. The 100 μL of isopropanol was added, the plates were gently shaken for 2 min to dissolve the formed formazan crystals and then absorbance was measured at dual wavelengths of 540/690 nm using the microplate reader (Molecular Devises, SPECTRUM AX190). The main reason for the dual wavelengths is that formazan crystals are being measured at 540 nm while the background absorbance (for the cells) is being measured at 690 nm. This background absorbance is then subtracted from 540 nm. The IC50 values were then calculated graphically (logarithmic scale) by plotting % viability versus concentration. The % viability was calculated by considering the optical density of the control well as 100% viable 18, 19. Stability Study of Micelles: The micellar formulations were stored at 2-8 ºC and room temperature for one month. After 15 days and 30 days, the formulations were analyzed for % EE and % DLE using UV-visible spectrophotometry as an analytical method. 1 mL of the formulation was centrifuged, and the supernatant was diluted up to 10 mL with methanol, sonicated for 10 min and analyzed for SMV remaining. Compatibility Studies: Pre-formulation is the main study to rule out any potential incompatibilities between the drug and excipients of the formulation. The interactions between drug and the excipients have been evaluated by comparison of FTIR and DSC spectra’s of physical mixtures with the individual components. The FTIR spectra of plain SMV, physical mixture of excipients and physical mixture of SMV and excipients are shown in Fig. 1. 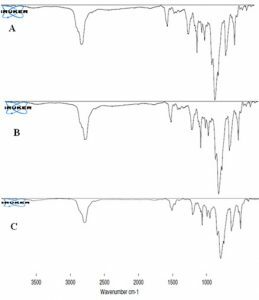 The appearance of new absorption bands or broadening of bands in the FTIR, appearance or disappearance of endothermic or exothermic peaks in thermal curves are the main characteristics to evidence interactions between drug and excipients 15, 20. The FTIR spectra of plain SMV and physical mixture (SMV/TPGS/P188, 1:1:1 ratio) confirmed that there was no major broadening, loss or appearance of functional peaks between the spectra of drug and physical mixture. Thus, no major drug-excipients interactions have been observed in FTIR spectra, confirming that SMV is compatible with the components of the formulation. The DSC curves of plain SMV, physical mixture of excipients and physical mixture of SMV and excipients are shown in Fig. 2. The plain SMV showed a sharp endothermic peak at 138.95 ºC whereas the TPGS and P188 showed an endothermic peak at 38 ºC and 53 ºC, respectively. In the physical mixture, a very smaller peak was observed for SMV which suggests that the drug was get solubilized in the melted excipients, and some crystalline drug remains which resulted in a smaller endothermic peak at 126 ºC. Further, this slight shift of melting point is might be due to the influence of excipients. Also, these results are by the previous reports 16. CMC of Micelles and Mixed Micelles: The critical micelle concentration (CMC) can reflect the stability of the micelles when they are diluted in- vivo. Here, the CMC is determined by iodine UV-visible spectrophotometric method. The CMC of SCMs and MMs were found to be 0.35 and 0.10 mg/mL, respectively. The observed CMC value of MMs was very less (3.5 fold) compared to the single copolymer micelles; this is probably due to increasing in hydrophobic interactions between the PPO segment of poloxamer and vitamin E portion of TPGS in the core of micelles 21. Furthermore, this result is in agreement with the system of the single surfactant and mixed surfactant, where the CMC of a mixture of surfactant system is lower than that of single surfactant system 12. Also, the lower CMC value of MMs provides higher systemic stability than single copolymer micelles following systemic dilution 14. 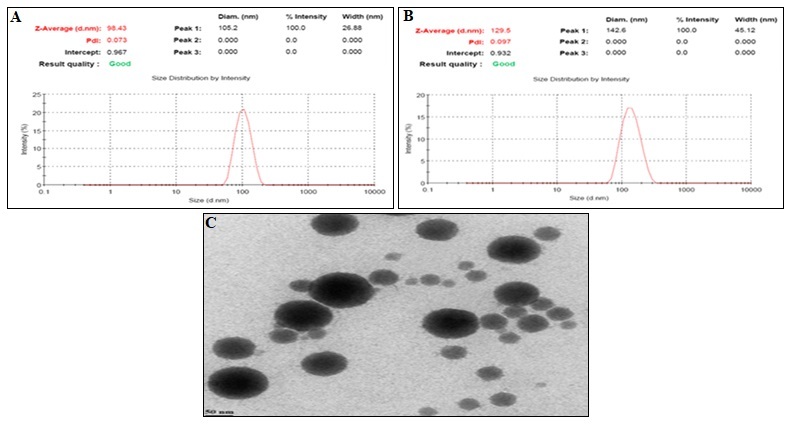 Preparation and Characterization of Micelles and Mixed Micelles: In the present study, the SCMs and MMs were prepared by a solvent evaporation technique. Table 1 shows the comparative SMV % EE and % DLC of SCMs and MMs. We found about 79.7 ± 5.6% SMV loading in SCMs at SMV: TPGS ratio of 1:2. We observed about 94.5 ± 6.5% SMV loading in MMs at SMV: TPGS: P188 ratio of 1:2:2. This higher (about 15%) SMV loading with MMs is might be due to the increase in copolymer concentration. Further, these results are by the previous report 22. The mean particle size and size distribution of SCMs and MMs are presented in Table 1. The mean particle size of SCMs (1:2 ratio) is 98 ± 5 nm with PDI of 0.07 ± 0.01 and MMs (1:2:2 ratio) is 129 ± 6 nm with PDI of 0.09 ± 0.01 Fig. 3A and B., The increased mean particle size of MMs, could be correlated to the presence of high molecular weight linear (Average molecular weight of 8400 Daltons) poloxamer 188. The nanosized micelles were accounted for enhanced permeability and retention (EPR) effect. The sizes of prepared micelles were found in nanometer; therefore we could expect better accumulation at tumor by EPR effect 14. Thus, the prepared nanosized SCMs and MMs are suitable for tumor-specific accumulation. The average zeta potential of SCMs and MMs were found to be -0.79 ± 0.11 and -3.77 ± 0.81 mV, respectively. The TEM images of MMs Fig. 3C confirmed the homogenous, non-aggregated, spherical shaped MMs in size range of 50-100 nm. In-vitro Release Study: The release profile of SMV from plain SMV, SCMs, and MMs is shown in Fig. 4. The 1% (w/v) Tween-80 was added in the release medium (PBS, pH 7.4) to maintain sink condition during the release study 14. The results revealed significantly increased release of SMV from SCMs and MMs when compared to plain SMV solution after 48 h. We observed only 29.6% SMV release with plain SMV solution whereas SCMs and MMs showed about 51 and 70% SMV release after 48 h of study. However, micellar formulation showed the significantly controlled release of SMV (24-30%) up to 24 h when compared to 48 h. The more release of SMV from SCMs and MMs could be attributed to the presence of TPGS and P188 which would facilitate the release of SMV for its greater hydrophilicity in the micellar system. Moreover, the hydrophobic core of single and mixed micelles restricted the drug’s release, as SMV is physically entrapped in this inner fraction 23, 24. The significantly increased release of SMV was noticed from MMs when compared to SCMs. This could be due to the more hydrophilic character of P188 causing more solubility in release medium 25. To analyze further the mechanisms of SMV release-rate kinetics, the in-vitro release profiles were plotted in various kinetic models: zero-order release, first-order release, Hixson-Crowell model, Higuchi model and Korsmeyer-Peppas model using PCP Disso v3 Software. For this purpose, the linear portions of curved graphs were used to model SMV release kinetics. The coefficient of determination (R2) of the release kinetic models was calculated from the plots of the above-said models. Among these models, the best linearity was found in zero order plot (R2 value of 0.9916 for plain SMV, 0.9912 for SCMs and 0.9958 for MMs) with a non-Fickian release exponent (n = 0.62966 for plain SMV, 1.0681 for SCMs and 1.4406 for MMs). R2 > 0.95 was used to determine the best fit of the model. Also, these results are following the previous report 16. In-vitro Hemolysis Study: The in-vitro hemolytic test was performed to realize whether the prepared SCMs and MMs are safe and suitable for intravenous injection. The study was performed by incubating human RBCs with different concentrations of plain SMV, SCMs, and MMs for 1 h at 37 ºC on a shaker incubator. The results of the hemolytic test (% hemolysis ratio, % HR) are shown in Table 2. We observed concentration-dependent hemolysis with all tested formulations during the study. Complete hemolysis was observed with the positive control (RBCs dispersed in deionized water). The solution was red clear diaphanous, and there was no erythrocyte detected at the bottom of the tube. No/very slight hemolysis was observed with negative control (RBCs dispersed in 0.9% NaCl solution). The spectrophotometric results showed 21% hemolysis with plain SMV (20 μg/mL). This is significantly high when compared to % hemolysis (<5%) observed with SCMs and MMs at similar concentration implying that the SCMs and MMs do not cause red blood cell rupture. However, the increase in concentration and incubation time may cause increased hemolysis. Thus, the hemolysis test results revealed that the prepared micellar systems are safe and biocompatible for intravenous injection. Furthermore, these results are by the previous report 16. Values are mean of three individual experiments — % HR: % hemolysis ratio. In-vitro Cytotoxicity Study: The anti-tumor efficacy of the plain SMV and SMV-loaded micellar formulations against MCF-7 cells was determined using MMT dye reduction assay. The cytotoxicity of plain SMV was compared with the SMV-loaded SCMs and MMs to know the importance of encapsulating SMV in the core of the co-polymeric micelles. The IC50 is a quantitative evaluation of the in-vitro therapeutic effect of a dosage form. It is defined as the drug concentration required for killing 50% of incubated cells in a designated period. In the present study, all formulations exhibited concentration and time-dependent inhibition of MCF-7 cell proliferation Table 3. The results showed that SMV-loaded micellar systems have greater effect against MCF-7 cells than plain SMV at the same concentrations after 24 and 48 h of incubation. It means SMV-loaded SCMs and MMs demonstrated higher cytotoxicity than plain SMV solution. Therefore, the developed SMV-loaded SCMs and MMs could enhance the therapeutic effect of SMV. The possible mechanism underlying the enhanced efficacy of SMV loaded micelles against cancer cells is that the nanoparticles carry the drug into cancer cells by endocytosis and enhance intracellular drug accumulation by nanoparticle uptake 21. Also, the TPGS has been reported to show anticancer property against different cancer cell lines 26. Therefore, significantly increased the cytotoxicity of SMV-loaded SCMs and MMs could be better correlated to the presence of TPGS copolymer in the micellar formulations. Amongst the micellar formulations, the MMs showed significantly decreased IC50 values (at both 24 and 48 h treatment) as compared to SCMs. The internalization of single mixed micelle carrying high SMV payload, compared to a plane, would make more SMV availability in the cytoplasm. This higher SMV concentration in the cells could be another possible reason for significantly higher cytotoxicity of MMs than SCMs. Additionally, the higher cytotoxicity of MMs is probably due to different particle size and drug release profile. Furthermore, these obtained results are by the previous reports 16. Micelles Stability: The drug content of SMV-loaded SCMs and MMs did not change significantly after 1 month of storage at 2-8 °C. However, the storage at room temperature (25 ± 2°C) caused significant (90%) leakage of loaded SMV after 1 week of storage. These results revealed the high storage stability of micellar formulations at refrigeration temperature than room temperature. Also, no significant difference in % drug retained amongst micellar formulations was noticed after one month of storage under refrigeration. CONCLUSION: In this study, we have described the preparation and characterization of Simvastatin-loaded TPGS micelles and MMs composed of TPGS and poloxamer 188. The developed MMs displayed small particle size with improved SMV loading and sustained release profile up to 24 h. Therefore, we could expect improved targeting of SMV to diseased (tumor) tissue via the EPR effect following intravenous administration. Furthermore, the micellar (MMs) Simvastatin caused significantly improved cytotoxicity against breast cancer cell line (MCF-7) than plain drug solution and SCMs. Besides, MMs caused significantly less hemolysis during the in-vitro erythrocyte lysis assay indicating their biocompatible nature and suitability for i.v. injection. Therefore, the developed SMV-loaded MMs could improve the targeting and therapeutic efficacy of loaded SMV against hormone-dependent carcinomas such as breast, prostate, and ovary. However, further studies are needed to ascertain these facts. ACKNOWLEDGEMENT: We are greatly thankful to our Head of Institute and Institute Management for supporting this research project. CONFLICT OF INTEREST: The authors declare no conflict of interest, financial or otherwise. Stacy ML, James A and Arun S: Metabolic profiling of hormone-dependent cancers: A Bird's eye view. Trends Endocrinol Metab 2015; 26(9): 477-485. McGuire A, Brown JA, Malone C, McLaughlin R and Kerin MJ: Effects of age on the detection and management of breast cancer. Cancers 2015; 22: 908-929. Stanley PL, Leong MD, William W and Tseng MD: Micrometastatic cancer cells in lymph nodes, bone marrow and blood clinical significance and biological implications. CA Cancer J Clin 2014; 195-206. Wang J, Yao X and Huang J: New tricks for human farnesyl transferase inhibitor cancer and beyond. Med Chem Commun 2017; 8: 841-854. Singh P, Saxena R, Srinivas G, Pande G and Chatto-padhyay: Cholesterol biosynthesis and homeostasis in the regulation of the cell cycle. Plos One 2013; 8(3): 1-12. Van de Donk NW, Bloem AC, Vander SE and Lokhorst HM: New treatment strategies for multiple myeloma by targeting BCl-2 and the mevalonate pathway. Curr Pharm Des 2006; 12(3): 327-340. Marwan IA, Mohammed NA and Alan R: Inhibition of the mevalonate pathway augments the activity of Pitavastatin against ovarian cancer cells. Scientific Reports 2017; 8649-59. Ghassan FS: A review on hyperlipidemia: Types, treatments and new drug targets. Biomedical and Pharmacology Journal 2014; 7(2): 399-402. Cagel M, Bernaeu E, Gonzalez L, Lagomarsino E, Zubillaga M, Moretton MA and Chiappetta DA: Mixed micelles for encapsulation of doxorubicin with enhanced in-vitro cytotoxicity on breast and ovarian cancer cell lines versus Doxil. Biomedicine and Pharmacotherapy 2017; 95: 894-903. Zhao D, Zhang H, Yang S, He W and Luan Y: Redox-sensitive mPEG-SS-PTX/TPGS mixed micelles: An efficient drug delivery system for overcoming multidrug resistance. Int J Pharm 2016; 515: 281-292. Manjappa AS, Kumbhar PS, Patil AB, Disouza JI and Patravale VB: Drug loaded polymeric mixed micelles: suitable approach to improve therapeutic performance of single copolymer micelles. Crit Rev Ther Drug Carrier syst 2018; 020481. DOI: 10.1615/Crit. Rev. Ther. Drug Carrier Syst. Neophytou CM, Constantinou C, Papageorgis P and Constantinou AI: D-α-tocopheryl polyethylene glycol succinate (TPGS) induces cell cycle arrest and apoptosis selectively in survivin-overexpressing breast cancer cells. Biochem Pharmacol 2014; 89: 31. Manjappa AS, Kumbhar PS, Khopade PS, Patil AB, Disouza JI: Mixed micelles as nano polymer therapeutics of docetaxel: increased in-vitro cytotoxicity and decreased in-vivo Curr Drug Delivery 2018; 15(4): 564-75. Nanjwade BK, Manjappa AS, Murthy RSR and Pol YD: A novel pH-triggered in-situ gel for sustained ophthalmic delivery of Ketorolac tromethamine. Asian J Pharm Sci 2009; 4(3): 189-99. Dasam U, Natarajan J, Karri VVSR, Wadhwani AD, Antony J and Jeyaprakash MR: Targeting efficacy of Simvastatin for hormone-dependent carcinomas through solid lipid nanoparticles. J Nanomed Nanotech 2016; 7: 6. Twentyman PR and Luscombe M: A study of some variables in a tetrazolium dye (MTT) based assay for cell growth and chemosensitivity. Br J Cancer 1987; 56(3): 279-85. Goel PN and Gude RP: Unraveling the antimetastatic potential of pentoxifylline, a methylxanthine derivative in human MDA-MB- 231 breast cancer cells. Mol Cell Biochem 2011; 358(1-2): 141-51. Shen YA, Li WH, Chen PH, He CL, Chang YH and Chaung CM: Intraperitoneal delivery of a novel liposome encapsulated paclitaxel redirects metabolic reprogramming and effectively inhibits cancer stem cells in taxol-resistant ovarian cancer. Am J Trans Res 2015; 7(5): 841-855. Jindal N and Mehta SK: Nevirapine loaded poloxamer 407/pluronic P123 mixed micelles: optimization of formulation and in-vitro Colloids and Surfaces B: Biointerfaces 2015; 129: 100-106. Grimaudo MA, Pescina S, Padula C, Santi P, Concheiro AL and Nicoli S: Poloxamer 407/TPGS mixed micelles as promising carriers for cyclosporine ocular delivery. Mol Pharmaceutics 2018; 15(2): 571-584. Saxena V and Hussain MD: Poloxamer 407/TPGS mixed micelles for delivery of gambogic acid to breast and multidrug-resistant cancer. International Journal of Nano-medicine 2012; 7: 713-721. Ezequiel B, Lorena G, Maximiliano C, Esteban PG, Marcela AM and Diego AC: Novel Soluplus®-TPGS mixed micelles for encapsulation of paclitaxel with enhanced in-vitro cytotoxicity on breast and ovarian cancer cell lines. Colloids Surf B Biointerfaces 2016; 1(140): 403-411. Bodratti AM and Alexandridis P: Formulation of poloxamer for drug delivery. J Funct Biomater 2018; 9(11): 1-24. Dian L, Yu E, Chen X, Wen X, Zhang Z, Qin L, Wang Q, Li G and Wu C: Enhancing oral bioavailability of quercetin using novel soluplus polymeric micelles. Nanoscale Res Lett 2014; 9: 684. Daria YA and Alexander VK: Pluronics and MDR reversal: An update. Mol Pharmaceutics 2014; 11: 2566-2578. Kumbhar PS, Patil NJ, Patil AB, Sambamoorthy U, Disouza JI and Manjappa AS: Simvastatin loaded nano mixed micelles: an approach to treat hormone dependent carcinomas. Int J Pharm Sci & Res 2019; 10(2): 546-54. doi: 10.13040/ IJPSR.0975-8232.10(2).546-54. Authors Address: Department of Pharmaceutics, Tatyasaheb Kore College of Pharmacy, Warananagar, Panhala, Kolhapur, Maharashtra, India.